The match took place two days before the 19th anniversary of the most famous day in English football history. But it was not arranged as some sort of joyous reunion. The horrific Bradford Fire two months earlier had claimed the lives of 56 fans and left many more injured, with this fixture arranged to support the disaster appeal fund. Given the relatively short notice of the fixture being arranged it was impressive that the famous 1966 England starting XI all took to the field, while West Germany brought seven members of their team with them. Sir Alf Ramsey was unfortunately absent due to other commitments, while England’s substitutes bench contained a mix of veteran players who mostly were not members of the 1966 squad (Jimmy Armfield was one exception). As with 19 years earlier, England wore red shirts and the West Germans were in white. The Charlton brothers embrace at the end of the match. The match took place after the equivalent passage of time as if a Euro ’96 semi-final rematch was held now, so to older fans the 1966 glory still probably felt relatively recent. But for a whole generation of England followers they had grown up having missed out on experiencing the glory as it happened, so this was their chance to see these players in the flesh. All had unsurprisingly now called time on their playing days, although Alan Ball had been appearing in the Football League with Bristol Rovers just two years earlier. Ray Wilson faced a struggle even to make it into the field having undergone a series of knee operations, bravely playing for four minutes before leaving the action. Despite having lost sight in one eye since the 1966 glory, Gordon Banks again took his place between the sticks. 1985 was a wet summer for the most part and that was the case on this Sunday afternoon at Elland Road, but a crowd of just under 20,000 turned up in the rain and raised more than £46,000 for the appeal. The general argument is that great players never lose their skill, just their pace. There was much evidence of this in the rematch. It was basically a slower version of past meetings between the sides, although several West German players seemed to be particularly up for it early on and had an extra yard of pace as they went in search of some revenge for 1966. Wolfgang Overath – who commentator John Helm said still played football every day – looked particularly impressive and lively, while Lothar Emmerich kept creating from the left flank and 49-year-old Uwe Seeler showed he still had the old magic touch by scoring two excellent first half goals. The West Germans were two goals ahead on three separate occasions in a hectic opening quarter of the game, eventually going in 4-3 up at the break. But England would come back to emerge 6-4 winners, as the crowd went home having enjoyed their afternoon of nostalgia. As with the more famous meeting of the two sets of players, Geoff Hurst bagged a hat-trick as England came from behind to triumph. But as The Guardian reported, this “appeared to owe less to stage management than to his lingering predatory instincts”. Martin Peters again found the net as history seemed to be repeating itself a fair bit, but Ball made up for not scoring in 1966 by doing so twice this time around – the first being a superb chip. 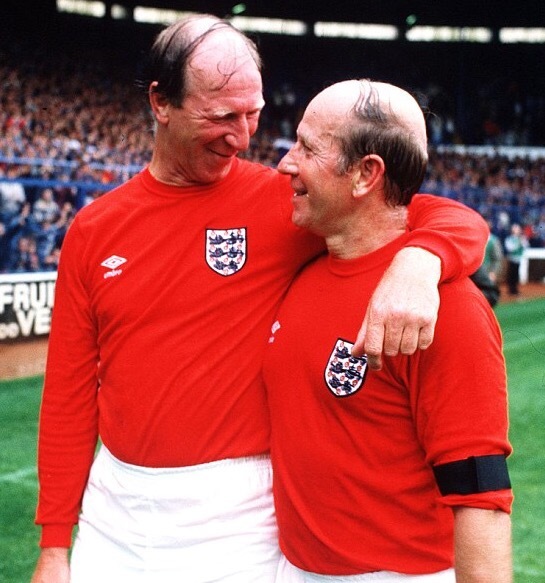 Bobby Charlton – who tried the occasional trademark long-range effort – was surprisingly nominated by his team-mates as the worst player, taking the ‘accolade’ in the spirit it was intended. As a nice footnote to this story, in December 1986 Bradford City finally returned home to Valley Parade. They marked their homecoming with a match against an England XI in front of a bumper crowd, with City winning 2-1. After such a traumatic couple of years, this was a day for the people of Bradford to enjoy. For more photos and press cuttings from the 1966 rematch, this Flickr page is well worth a look.